Our fabulous Fall Book Sale is on the horizon…. Fall Book Sale chair, Billie Stewart, reports that donations for our Fall Book Sale have been first rate this year – especially fiction, mystery and cookbooks of every kind! 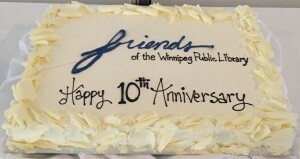 If you have gently loved books (or CDs, DVDs) you want to pass on to support our work please drop them off in a bag or box marked “FRIENDS” at any branch of the Winnipeg Public Library. Need help? Just call 204-488-3217 and we’ll be happy to pick them up. Thank you! This year’s sale will be held on the weekend of October 17th and 18th at Grant Park High School. Mark it on your calendar and we’ll see you there! Spring sunshine flooded the room at the Gates on Roblin on Sunday morning, May 3rd, for the Tenth Anniversary Books & Brunch, a Friends’ signature fundraiser. Guests were greeted by a gorgeous Gates’ Brunch, a great Rainbow Auction and some very entertaining speakers. The highlight of Books & Brunch is always “Books I Have Known and Loved”. First we welcomed Charlene Diehl, Director of the Winnipeg International Writers Festival, poet, and extreme book-lover. “Loving Canadian Kids Books” was her title. She reminded us these books aren’t just for children and that the books we love as children stay with us all our lives. Ron Robinson followed, with an eclectic list that ranged from The Poky Little Puppy to The Short Stories of Raymond Chandler, interspersed with the particular humour for which Ron is “known and loved”. Hear more of Ron and Books as host of Pages on CKUW FM 95.9 Saturday mornings. MC Ben MacPhee-Sigurdson , Winnipeg Free Press Books Editor & Wine Columnist, kept the proceedings moving nicely. The three were a great team and we hope to have them back. To top it all off, there was cake. A big thank you to all the volunteers who, over the past ten years, have made Books & Brunch the wonderful event it is. For the complete “Books I Have Known and Loved” lists from Charlene and Ron, see below. 2014 Book Sale – Another huge success! Our 10th anniversary Fall Book Sale held on October 25th and 26th broke the record by netting the Friends well over $12,000! Kudos to great volunteers who worked together to make this absolutely the best sale ever! In the words of Book Sale chair, Billie Stewart: “Whatever we’re doing, we should keep doing it”. What we do is offer a wide variety of books that are of good quality; we nurture our volunteers; and we are promoting and using the media well. Onward and upward to the 11th sale in the Fall of 2015! 2013 Book Sale – Best One Yet! The 9th Annual Fall Book Sale, held on Saturday and Sunday, October 26 and 27 at Grant Park High School, was another success, generating over $10,600 – the best year yet! There were nearly 150 people lined up at 10:00 a.m. on Saturday for the start of the sale, and traffic was great all weekend. Best of all, everyone – volunteers and customers – seemed to have a great time. What a great way to raise funds for our library and recycle all those great books into new homes! The Friday night set-up crew really appreciated the wonderful sustenance from Boston Pizza on Taylor (plus volunteer Pamela Bowles’ yummy Tunnel of Fudge cake). Weekend volunteers were fed well with donations from Taylor Avenue neighbours: Sobeys, Safeway and Subway! As always the staff at Grant Park High School was great. The caretakers looked after us well all weekend. A really big thank you goes to teacher Bobbi Milberg for sending us such wonderful student volunteers to help move boxes during Friday set-up. They were tireless and those strong young backs were lifesavers for us. Unsold books are redirected to agencies such as the Salvation Army. Selected paperbacks go to the Prison Library Project (http://www.mla.mb.ca/content/prison-libraries-committee). 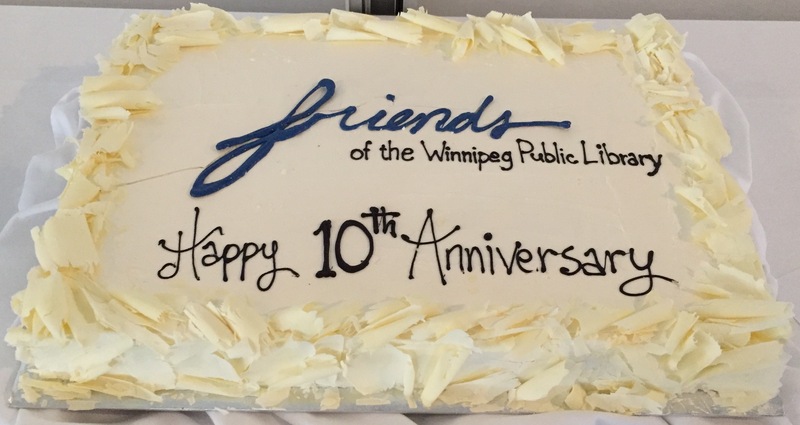 Since its inception, the sale has contributed over $50,000 to enrich our work in supporting important Winnipeg library projects. 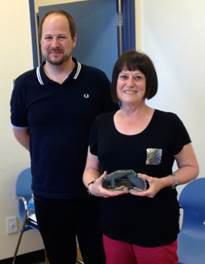 The Friends of the Winnipeg Public Library are proud to announce that Susan Fraser was awarded the 2013 Manitoba Library Service Award in the volunteer category. The service award honours an individual who has made an important contribution to the development of libraries and library services in Manitoba. Susan received her award at the Manitoba Library Association Annual General Meeting held at the Winnipeg Convention Centre on May 29th, 2013.
under her leadership, has realized unprecedented success in being able to financially support library programs which in turn has benefited countless Winnipeg citizens. Photo: MLA Past President Stephen Carney and honoree Susan Fraser.